Rannveig Aamodt lay on the ground, bleeding and broken, cradled in the arms of her husband Nathan Welton as the life-force slowly faded from her body. It was April 26, 2012, and Aamodt, then 28 years old, a professional rock climber from Norway, had made a basic rope error at the top of rock climb in Geyikbayiri, southern Turkey. She crashed 16m to the ground. “I can still see her falling: in a sitting position with outstretched arms that made small clockwise circles, like a bird falling from the nest,” Welton says. “I can hear the nauseating thud of impact; the cracks of snapping bones and tearing flesh. Aamodt’s bones protruded from her right ankle and elbow, and both feet were pointing in the wrong direction. She had three fractures in her back, and more in her pelvis, ankles and feet. Her ligaments had torn so severely that they had ripped off parts of the bone they were attached to. Bleeding from a gash in her forehead, she couldn’t move from the waist down. “I felt a heinous pain shoot up through my feet and legs and back, and I realized I was conscious, but barely,” Aamodt says. It took rescuers 90 minutes to arrive and take Aamodt to hospital in Antalya, where she went straight into surgery. Afterwards there was palpable joy when she dispelled fears of paralysis by moving her toes. A week later she flew to Norway where she spent months in rehabilitation. It seems scarcely believable that, within eight months of the accident, she would be climbing harder than ever. A fierce determination underpinned her rehabilitation. Even when she couldn’t get out of bed, she asked for a weight so she could start working out her left arm. She spent months in a wheelchair and back brace. It was 10 weeks before she could put weight on her ankles again. She started in a swimming pool and did what she could everyday – weights, cycling, harness-assisted running on a treadmill, and six to eight hours of daily stretching. After three months, she started climbing training again. 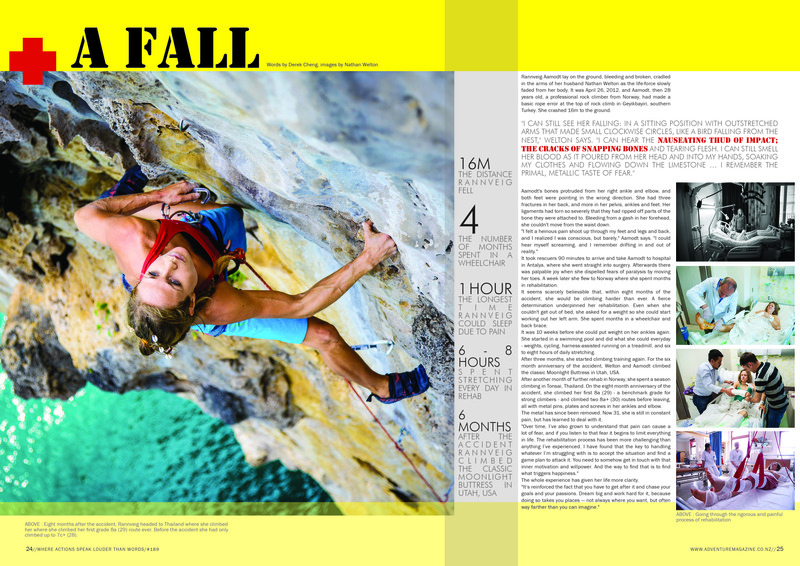 For the six month anniversary of the accident, Welton and Aamodt climbed the classic Moonlight Buttress in Utah, USA. After another month of further rehab in Norway, she spent a season climbing in Tonsai, Thailand. On the eight month anniversary of the accident, she climbed her first 8a (29) – a benchmark grade for strong climbers – and climbed two 8a+ (30) routes before leaving, all with metal pins, plates and screws in her ankles and elbow. The metal has since been removed. Now 31, she is still in constant pain, but has learned to deal with it. “Over time, I’ve also grown to understand that pain can cause a lot of fear, and if you listen to that fear it begins to limit everything in life. “The rehabilitation process has been more challenging than anything I’ve experienced. I have found that the key to handling whatever I’m struggling with is to accept the situation and find a game plan to attack it. The whole experience has given her life more clarity.